Touchscreen Office Notebook. 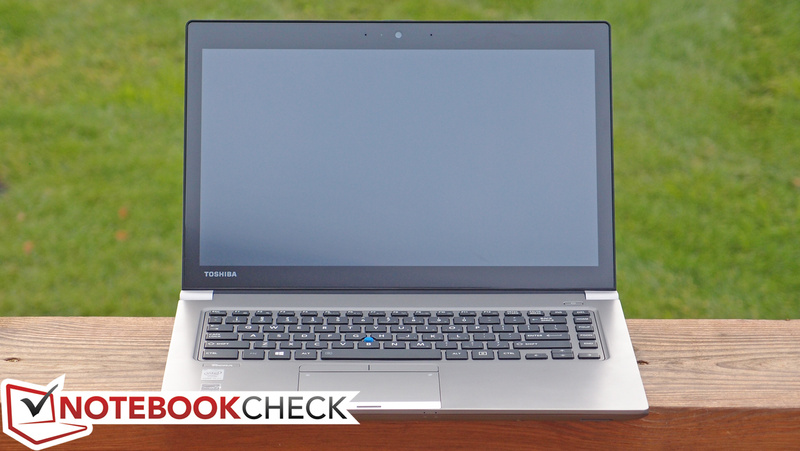 Toshiba hopes this premium Tecra, with a 1080p matte screen and many of the typical amenities of a top-end business notebook, can entice those looking for a touch business computer that’s light and long on battery. Does it check all the boxes? 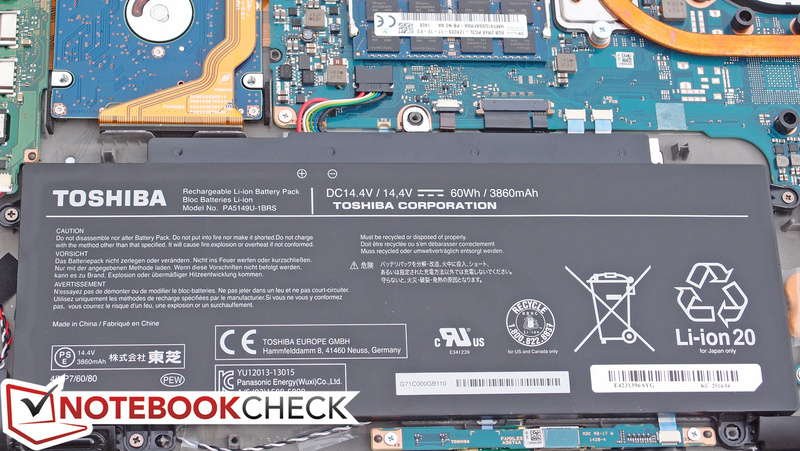 Just a couple of months ago, we spent some time with the Toshiba Tecra Z40 A-147 business notebook, which we judged to be overall good, with a few major drawbacks: a weak display, a cover that wears easily, and input devices which weren’t our favorite. Apart from that, we had few gripes—so when the Z40T-A1410 arrived at our offices, we were excited to see what enhancements it could bring to the table. 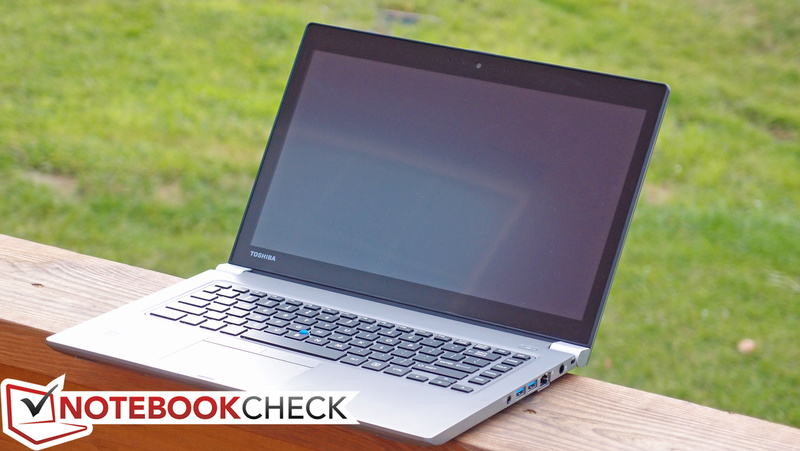 The two notebooks are in many ways equivalent; they share a nearly identical case design, comparable processors, the same storage device, and identical input devices. 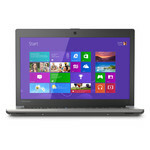 The Z40t-A1410, however, introduces a couple of important changes: for starters, a 1080p display panel which features 10-point multitouch and a matte finish (something which we’ve only thus far seen popularized by the latest Lenovo ThinkPad notebooks), alongside double the RAM (8 GB total) and an updated CPU (the Intel Core i5-4310U). 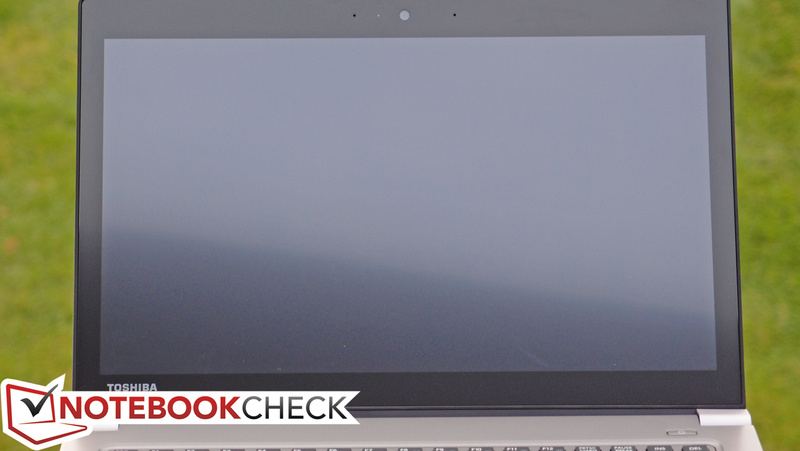 For $1,389 MSRP (a bit below $1,300 street price currently), is the Tecra Z40T the touchscreen notebook modern business users have been waiting for? The Z40T’s case is primarily comprised of magnesium alloy, so although it feels lightweight, it promises better-than-average resilience. Indeed, we encountered few areas of concern in the realm of flex, with the base unit sitting sturdily on its surface with only a bit of give in the middle under moderate pressure. The display lid, on the other hand, isn’t quite as robust; twisting or pressure from the back can produce visible distortions on the panel without a great degree of effort. It’s unlikely that this would manifest problematically during typical use, however. Thanks to the choice of construction materials, the Z40T is a highly portable machine. 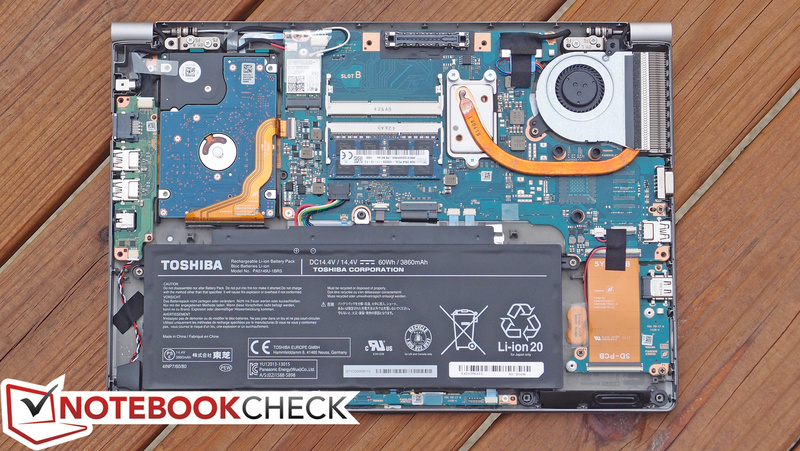 At just 1.624 kg and a thickness of less than an inch (0.95 mm), if it weren’t for the conventional mechanical hard drive, our review unit would qualify under the Ultrabook heading. The haptic impression of the construction is overall good, though the display lid still seems tragically susceptible to scratches (ours had already suffered a few by the time we began writing this review). 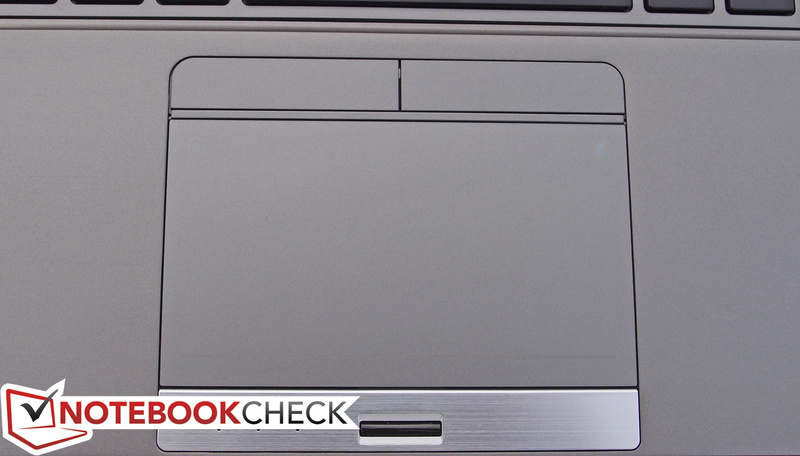 The hinges do a good job of supporting the touchscreen, quelling a common complaint with heavier display lids that results in wobble while typing or tapping the screen. One major oversight, meanwhile, is the subject of maintenance and upgrades. 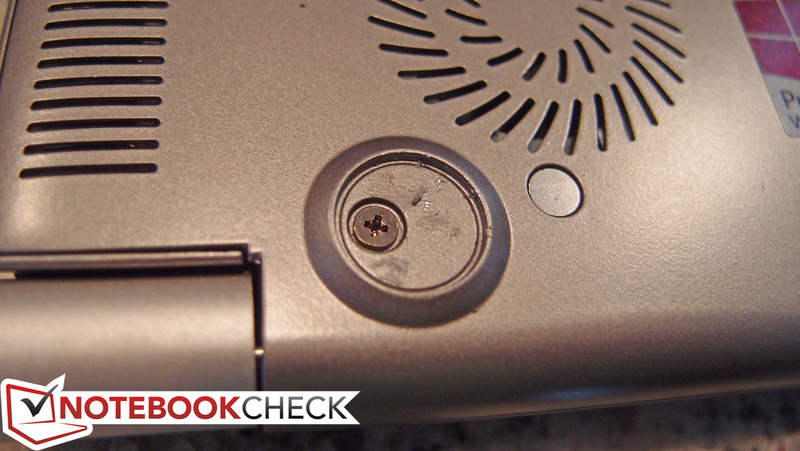 The Z40T inexplicably expects the user to remove eleven differently-sized screws—some of which are located underneath the notebook’s rubber feet, which must also be removed—to loosen the bottom panel. 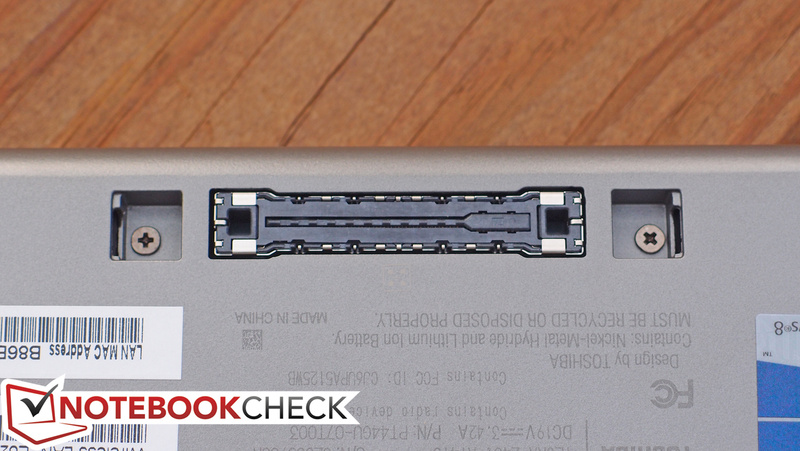 After this, the panel snaps upward and slides off the bottom of the notebook to reveal what is fortunately nearly every upgradeable component in the device. However, the bottom panel is also actually somewhat fragile, and the user will need to take great care not to damage it between the vent cutouts and the edge of the piece; ours already has a hairline fracture in this very location. Finally, it’s worth noting that the keyboard and display panel (like other touch panels) are not user-replaceable. In this regard, the Latitude E7440 is a much better overall design; just two screws reveal all of the internal components, and the keyboard is even replaceable thanks to some clever cable routing between the front of the base unit and the rear. 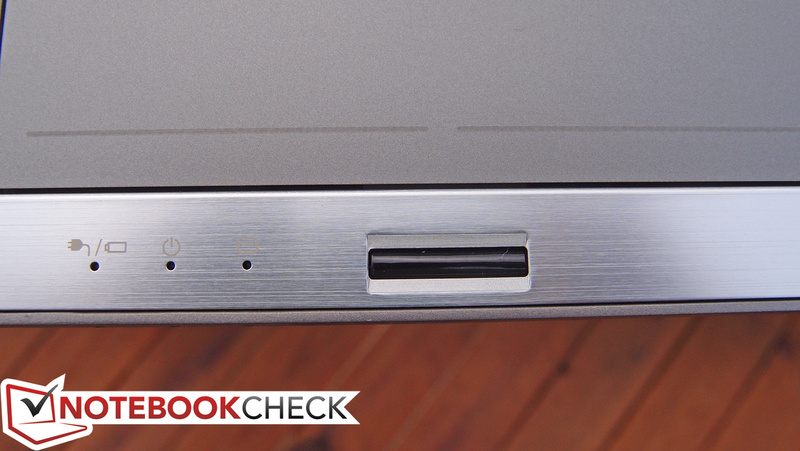 Toshiba does a good job of providing a full range of ports on the Tecra Z40T, beginning with three USB 3.0 ports (one powered) and extending to two different video output options (VGA and HDMI). The lack of DisplayPort is unfortunate but hardly a deal-breaker for most users, whereas the inclusion of a full-sized Ethernet port and SD card reader gives the Z40T a leg up on some of the competition. 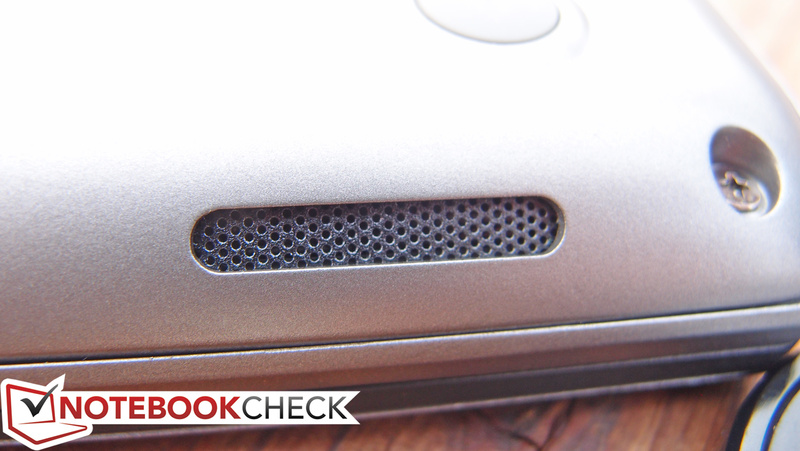 There’s also a docking station port on the bottom of the notebook, reinforcing the Tecra’s classification as a business companion. In comparison, the Latitude E7440 features an identical array of ports except it trades the VGA port for a DisplayPort—an arguably more versatile configuration, but one which will not benefit everyone. 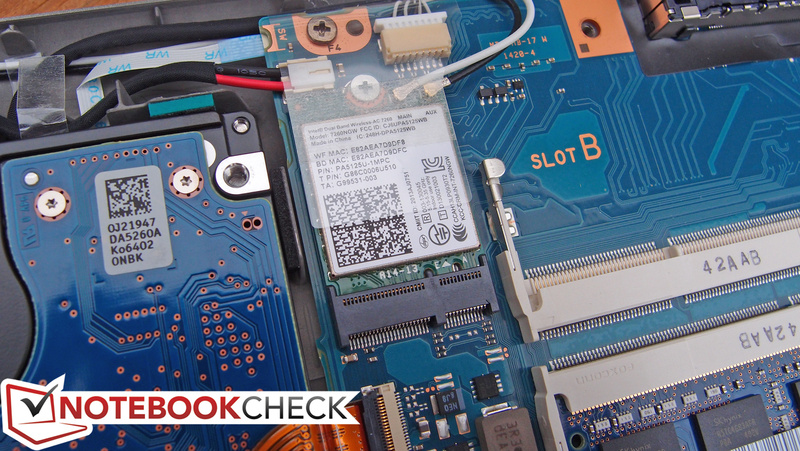 The Z40T packs a now-standard Intel Dual Band Wireless-AC 7260 2x2 adapter, which functioned well in our tests without any finicky driver or connectivity issues. 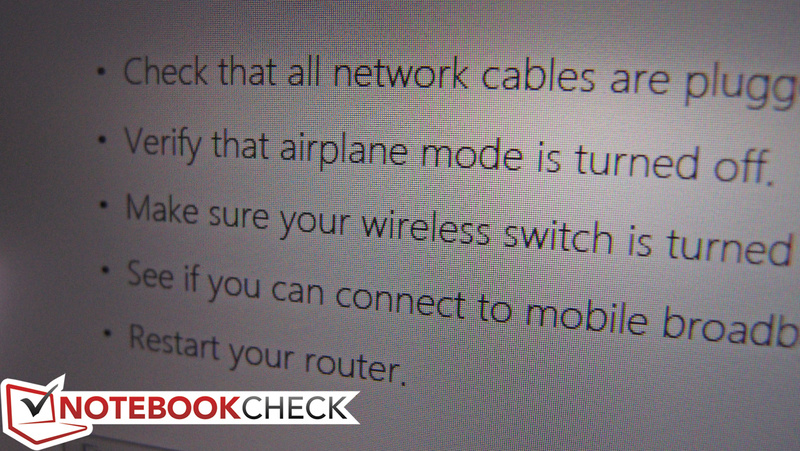 Alongside it is Bluetooth 4.0, which comes disabled by default but can be activated by the touch of a button. The aforementioned Gigabit Ethernet port provides requisite flexibility in the office. 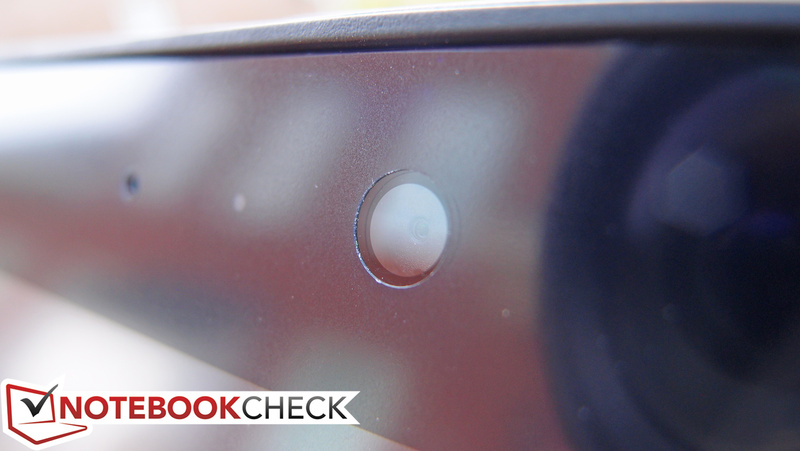 The smart card port which we found on our Z40 review unit is missing from the Z40T, but the 2.0 MP webcam remains untouched. We found the quality average at best, but it gets the job done nonetheless. 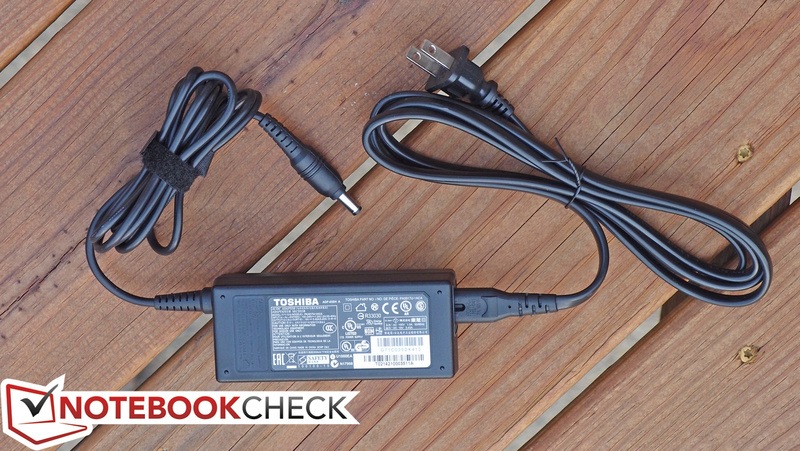 The Z40T arrives with only a 65W AC adapter included (weighing in at 336 grams). 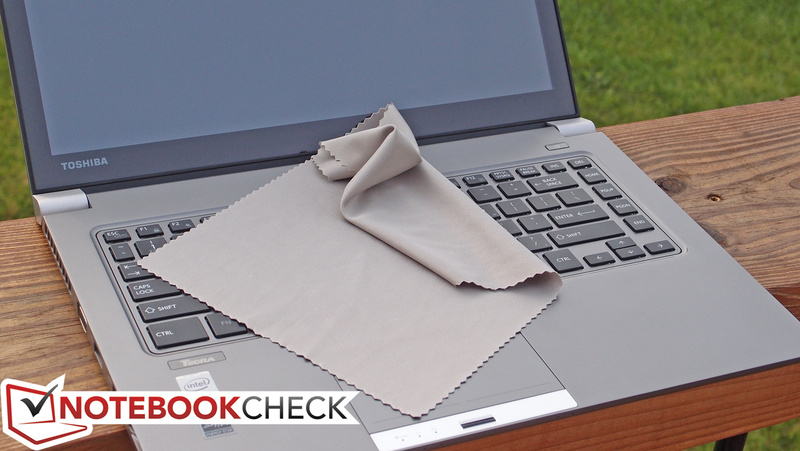 Well, that isn’t entirely true; you also get a small microfiber cloth to help keep your screen smudge-free. Apart from that, other accessories can be purchased separately, such as a Toshiba Hi-Speed Port Replicator III (value bundle linked), which adds four additional USB 3.0 ports and a complete range of video output options. The Tecra Z40T-A1410 prebuilt model includes a 3-year depot warranty standard, which is better than the 1-year warranty that configure-to-order models include. The keyboard is nothing to type home about. 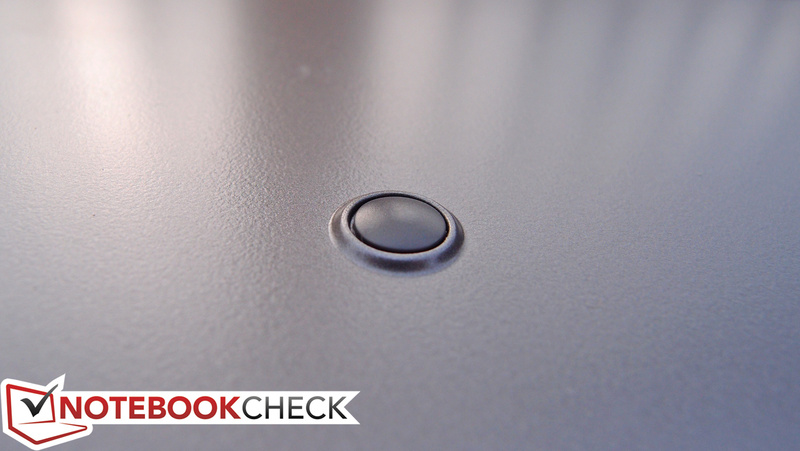 Likewise, the clickpad's lack of physical buttons will surely irk some businesspeople. 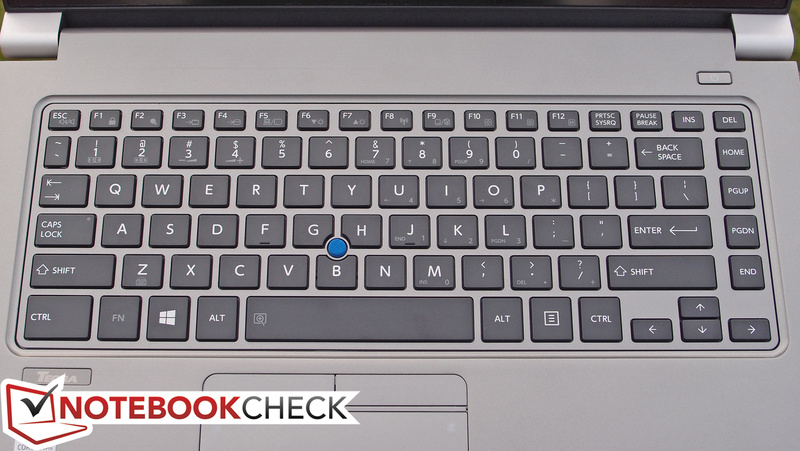 While it certainly isn’t bad, we weren’t overly impressed with the Z40T’s Chiclet-style keyboard. Key travel is average and feedback is a bit soft, as compared to—for instance—most similarly-sized ThinkPads and Latitudes. Layout also takes a little bit of adjustment, though it’s nothing terribly unpleasant. The backlighting and good key visibility are both appreciated. 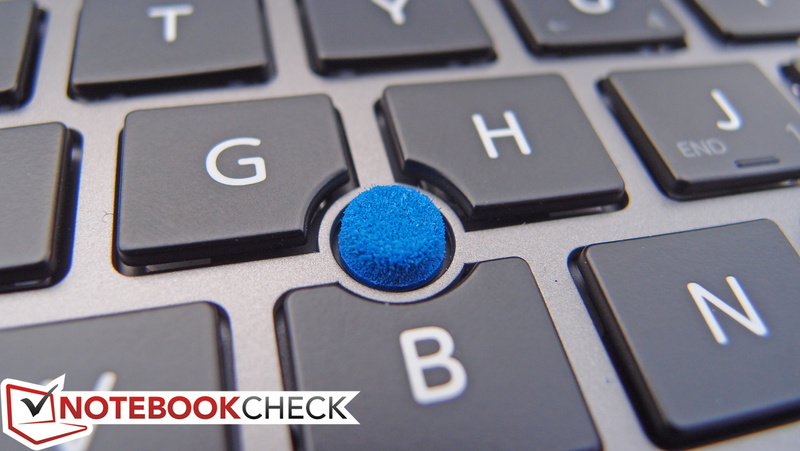 The comfortably large Alps clickpad was similarly decent, which is arguably an accomplishment for buttonless touchpads of any kind. 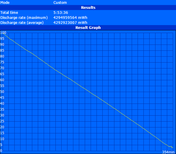 The usual irritations with drag-and-drop persist, but for the most part, the integrated buttons were tolerable. At least, this implementation is certainly preferable to the pad clicking strategy found on the most recent ThinkPads—though neither approach can compete with the Latitude E7440’s traditional physical buttons. On a brighter note, two-finger scrolling and other gestures such as pinch zoom were effortless and accurately interpreted. 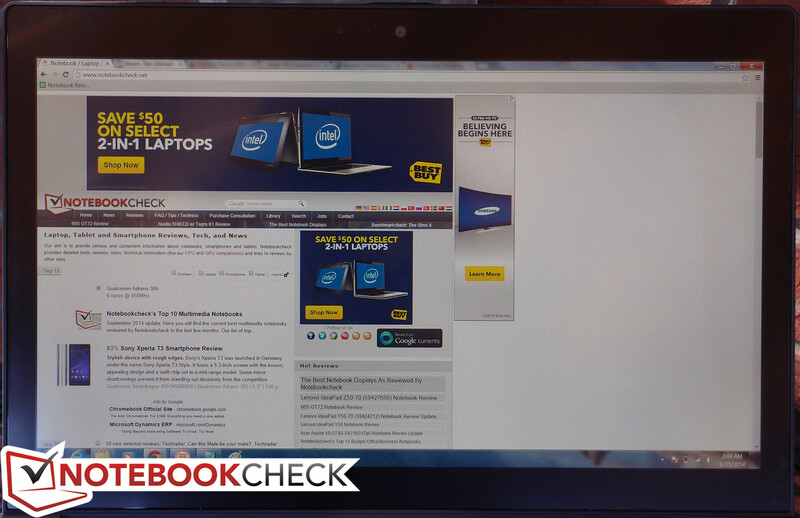 We experienced no trouble with the touchscreen, though Windows 7’s implementation of the interface is less streamlined than that of Windows 8.1. Navigation is consequently made more difficult overall. 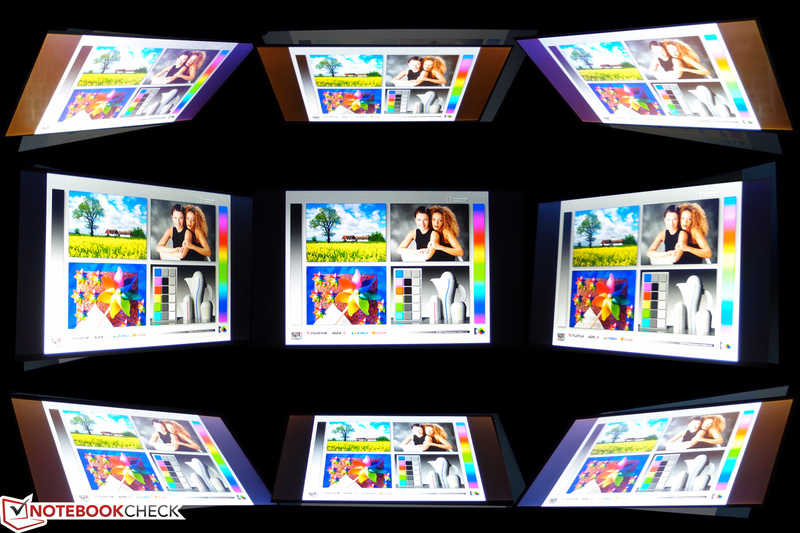 The Tecra Z40T’s 14-inch TFT LED display carries a resolution of 1080p (1920x1080 pixels), which factors out to 157 PPI. It’s a 10-point multitouch panel, something which the previous Z40 we reviewed lacked—and overall, it’s a much better display. 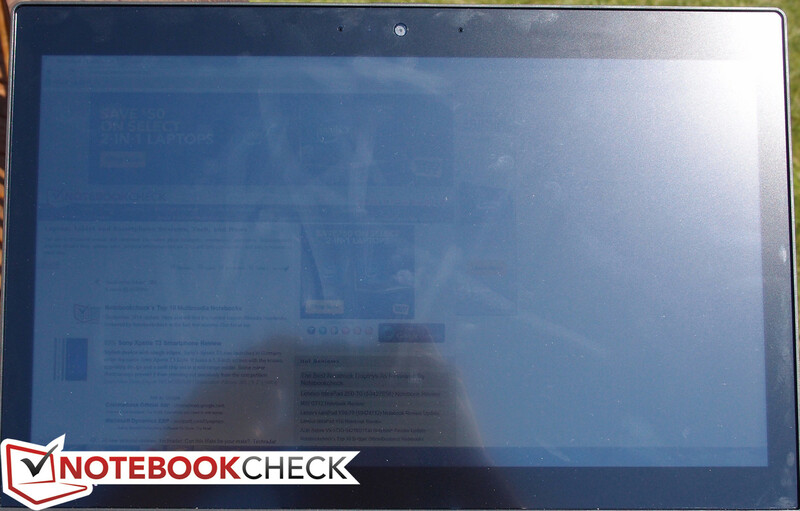 It even features a matte finish, which is a rarity for touchscreen notebooks. However, there is one significant drawback: the matte finish is a filter layer applied overtop of the actual screen, and the result of its existence is an extremely grainy look which is difficult to ignore. It’s noticeable enough that we’d wager many consumers would drop the touchscreen option or look elsewhere simply because of it—which is a shame. We measured 273 cd/m² average brightness with a distribution of only 76%—absolutely nothing special. Fortunately, the contrast ratio of 1193:1 is very good, and colors subjectively appeared to be fairly accurate. 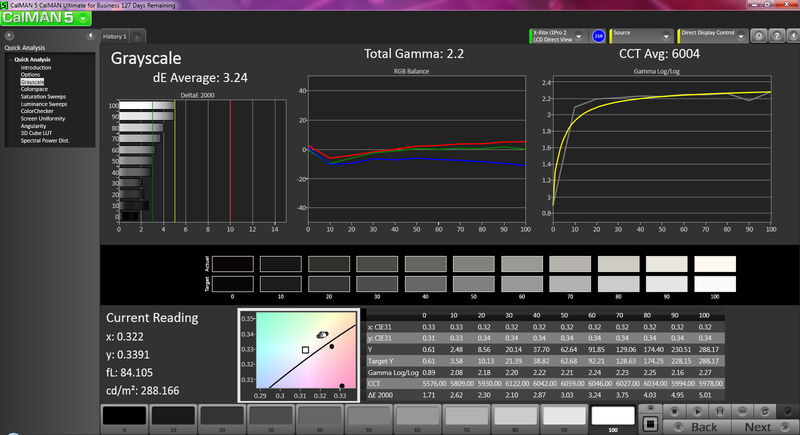 Gamut measurements are pretty typical for a business notebook, with a coverage of just 78% of sRGB. That’s more than sufficient for everyday office use. 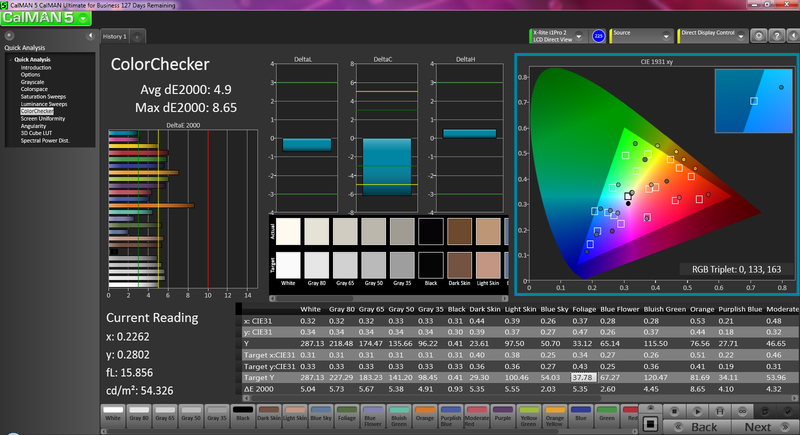 CalMAN 5 reveals that color reproduction is also quite accurate out of the box: an average DeltaE of 4.9 (ideal: 0) is better than most, with Orange being the most deviant at 8.65. 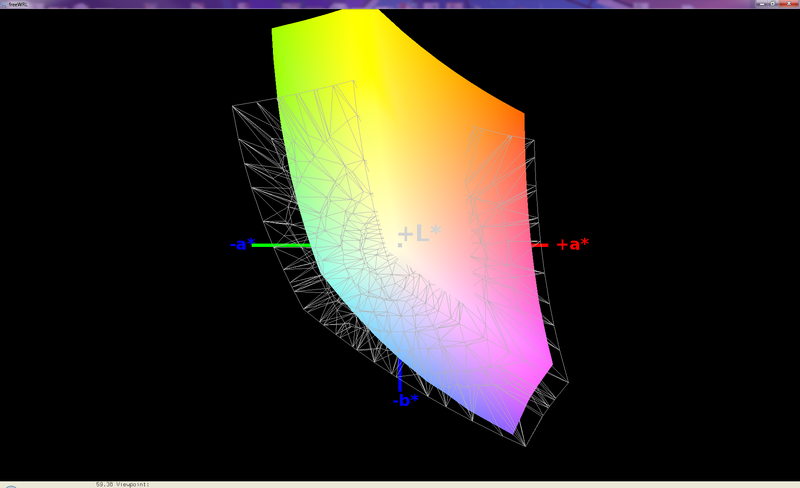 A total gamma value of 2.41 is also not far off the ideal mark of 2.2. A bit of calibration reins in these inaccuracies even further. 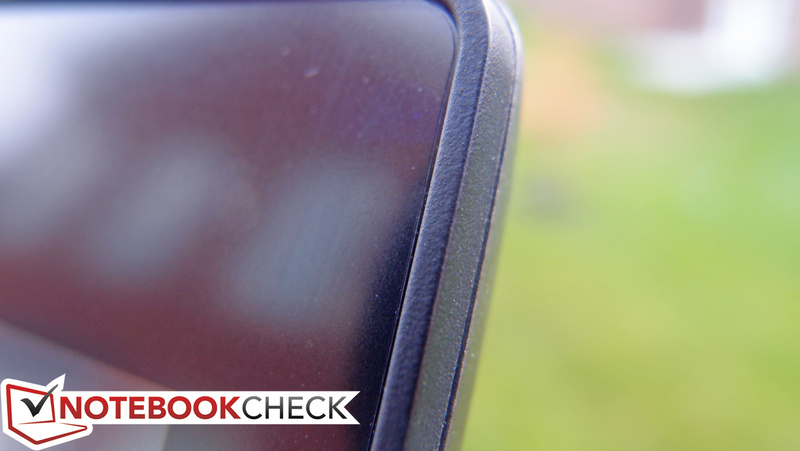 Outdoors, the Z40T is visible in shade, but in the sun, the screen quickly pales and becomes difficult to see, partially thanks to the obstructive matte filter we mentioned earlier. 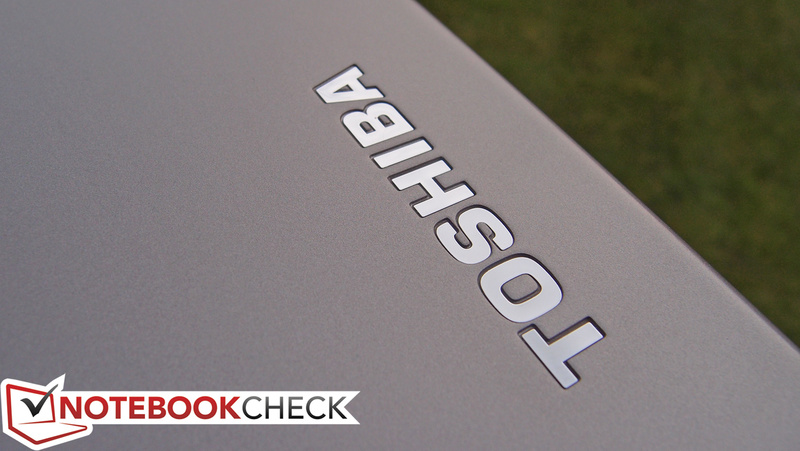 We were surprised to encounter excellent viewing angles, however—such that we have a hard time believing that the panel isn’t IPS, even though Toshiba doesn’t list it as such. Technically, there’s only one prebuilt Z40T configuration available (the one we’re reviewing). 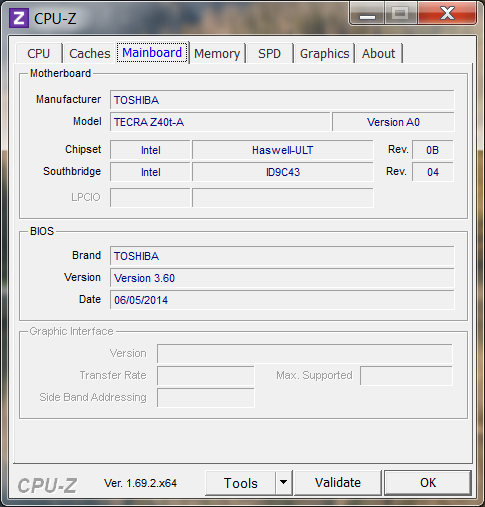 However, those who desire a bit of flexibility in the realm of specifications can find it via the Z40-ABT1400 configuration page, where you can choose a touchscreen for your Z40 and then pair it up desirable extras like a Core i7 CPU or an SSD. At any rate, the Z40T-A1410 features a dual-core Intel Core i5-4310U CPU and 8 GB of DDR3L 1600 MHz RAM (single-channel—with a maximum of 16 GB supported), along with integrated Intel HD Graphics 4400. It’s par for the course in modern business notebooks. 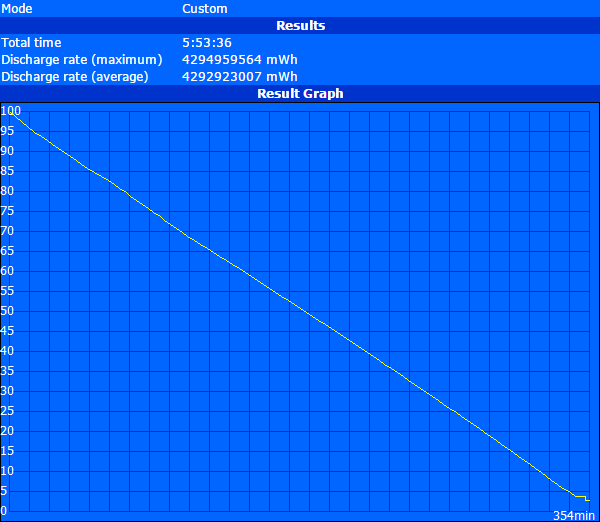 To check whether the notebook’s performance diminishes while running unplugged, we performed a subsequent run of 3DMark 06 on battery power. The score we received was practically identical to that of our original run (4548 vs. 4547 on battery), officially ruling out any concerns. 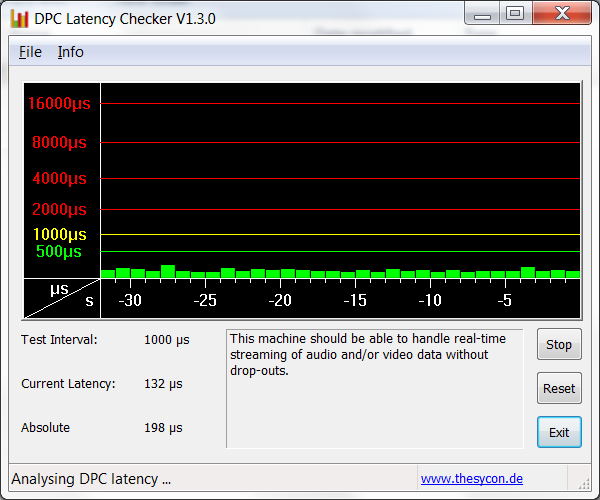 We also checked for DPC Latencies and encountered no problems. The Intel Core i5-4310U is a dual core CPU with a base clock rate of 2 GHz and the ability to Turbo Boost all the way to 3 GHz for one active core or 2.7 GHz for two active cores under optimal conditions. Its TDP of just 15 W makes it ideal for thin and light notebooks such as the Z40T. 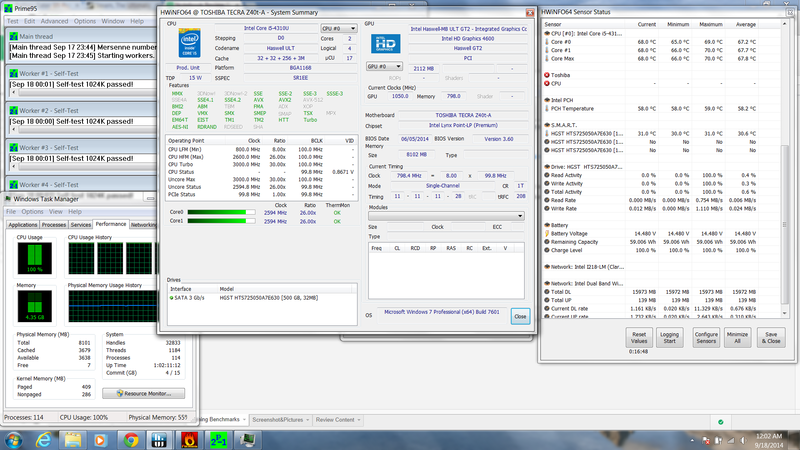 Comparatively, performance ought to be similar to its i5-4300U cousin, which is clocked just 100 MHz lower. 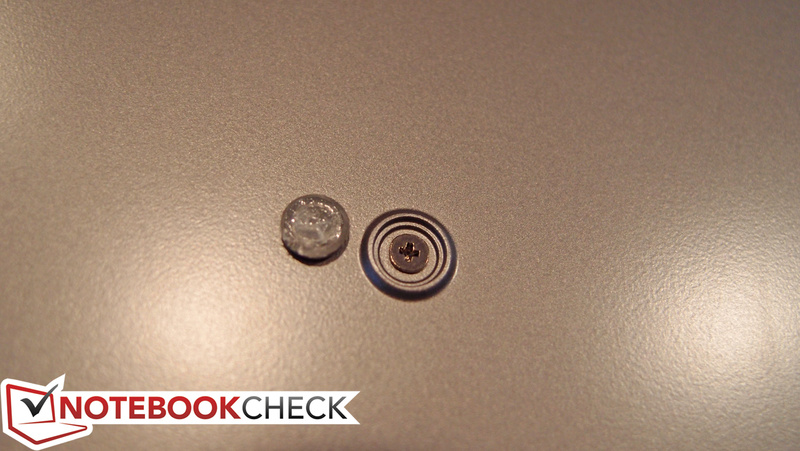 The i5-3537U is a close comparison as well. 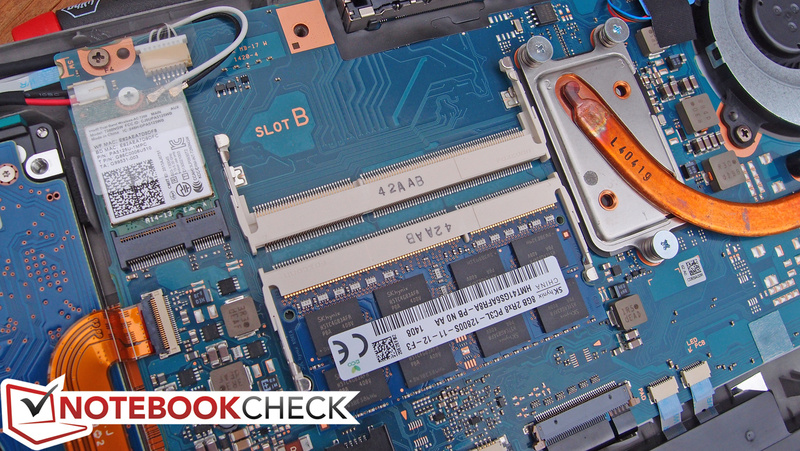 Since the Z40T is actually the first notebook we’ve tested with this particular CPU, we don’t have any direct comparisons to other models. 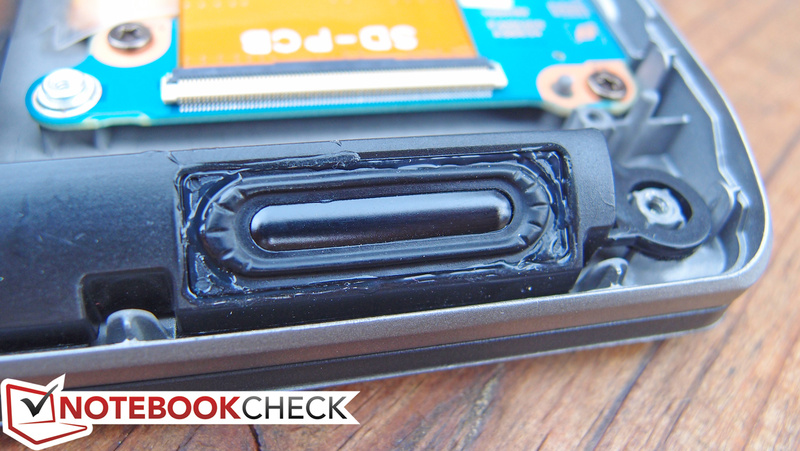 In actuality, we found mixed results versus the i5-4300U, suggesting some sort of thermal or TDP-based interference on the Z40T specifically. 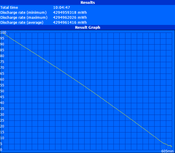 In wPrime 1024m, the Z40T recorded 677 seconds versus 640 seconds for the i5-4300U overall. 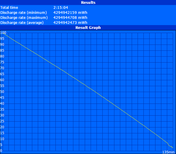 Likewise in Super Pi 32M (Z40T: 694 seconds vs. i5-4300U average: 679 seconds). 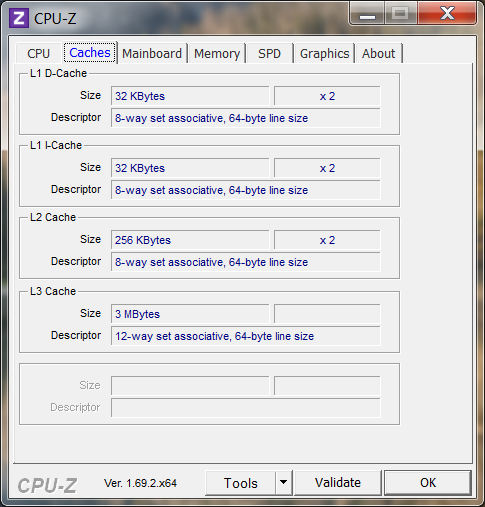 On the other hand, multithreaded performance in Cinebench R11.5 xCPU 64-bit was more positive: 2.9 vs. 2.6 for the i5-4300U. 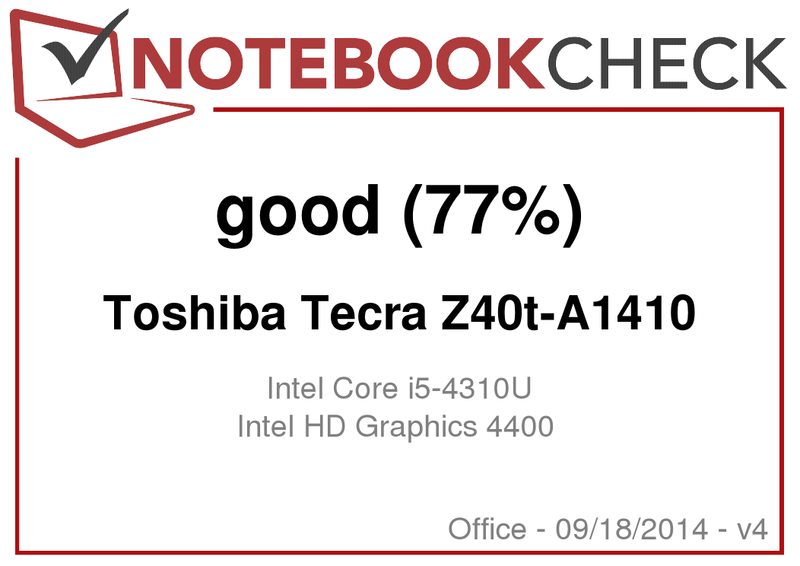 Thanks to the absence of a solid-state drive, it seems unlikely that the Z40T will fare very well in our synthetic system performance tests. Indeed, the single biggest upgrade that can currently be made to nearly any computer remains the replacement of a conventional hard drive with a solid-state drive. 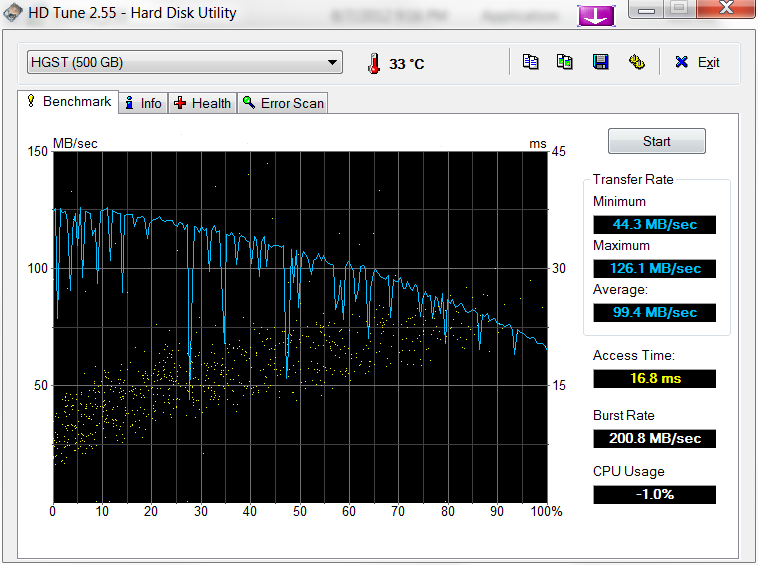 As expected, PCMark’s results lament the lack of solid-state storage. 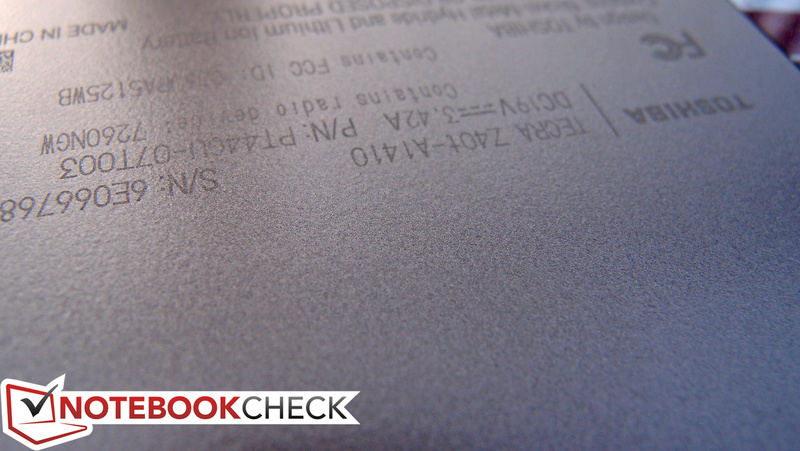 We encountered scores of 6833 in PCMark Vantage and 2686 in PCMark 7, both of which are weak by today’s standards. 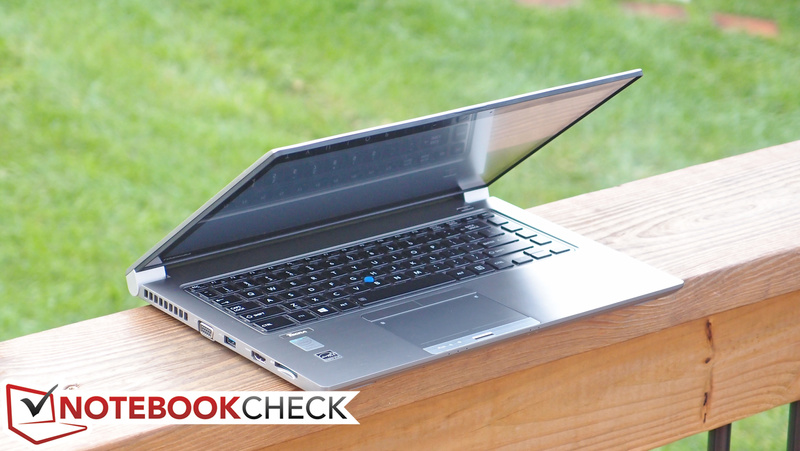 Most Ultrabooks score well above the 4,000 mark. The Tecra Z40T-A1410’s internal drive is a Hitachi Z7K500 model (HTS725050A7E630), which is a 7 mm height 7200 RPM conventional (mechanical) hard drive. 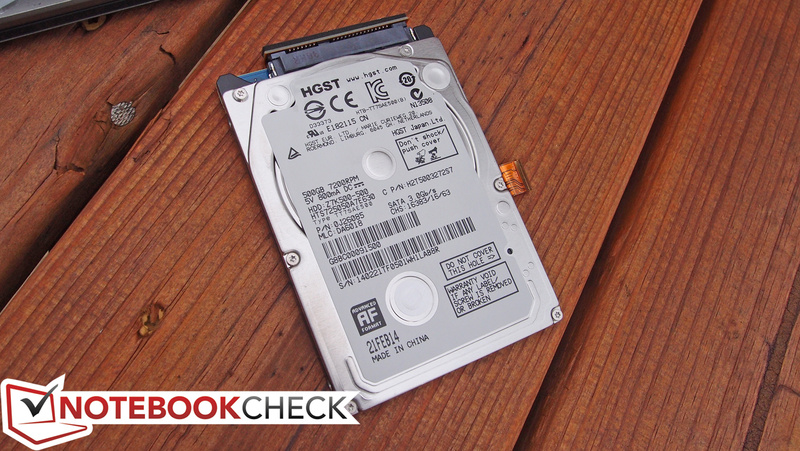 It’s not a bad drive as far as mechanical drives go, but as compared to the SSDs of many competitors, it’s incredibly slow for primary storage. 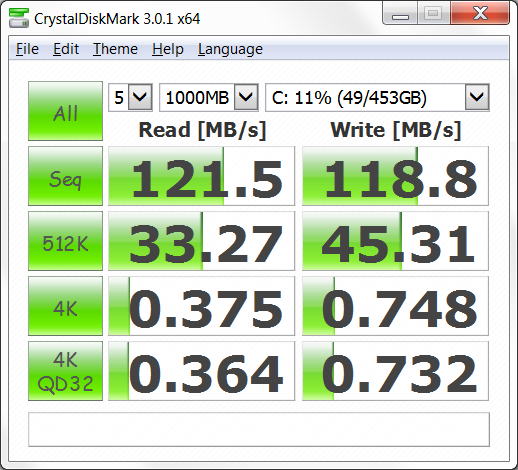 HD Tune reports a Transfer Rate Average of just 99.4 MB/s, while CrystalDiskMark shows Sequential Read/Write speeds of 121.5 MB/s and 118.8 MB/s respectively. 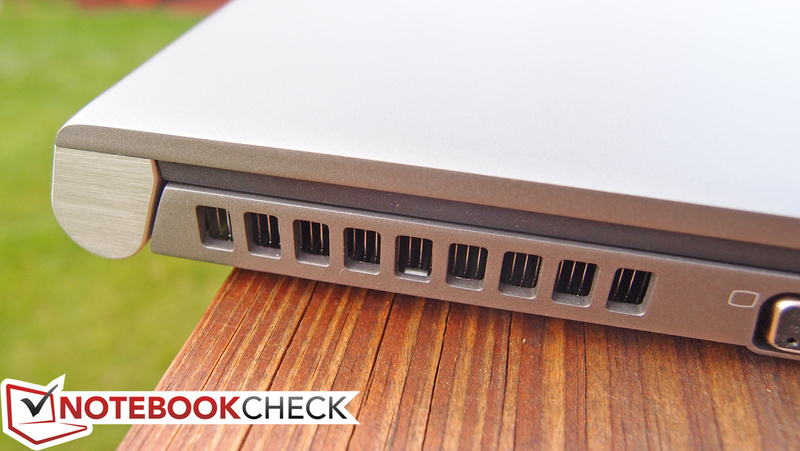 The drive can be replaced with an SSD at the risk of damaging the notebook while removing the back cover (as previously mentioned)—a process which is tragically difficult in light of the business classification of the Z40T. Since no other prebuilt options exist, the only other alternative is to configure a Z40-ABT1400 with a touchscreen and an SSD straight from Toshiba. Unfortunately, this option is also prohibitively expensive: the cost for an identical Z40 CTO model (3-year warranty included) with the smallest mSATA SSD offered (128 GB) is $1,573—nearly $200 higher. A configure-to-order Z40 can optionally be outfitted with an NVIDIA GeForce GT 730M (1 GB DDR3) discrete graphics adapter for another $120 (quite expensive)—but again, prebuilt models currently only exist with the specifications we received. 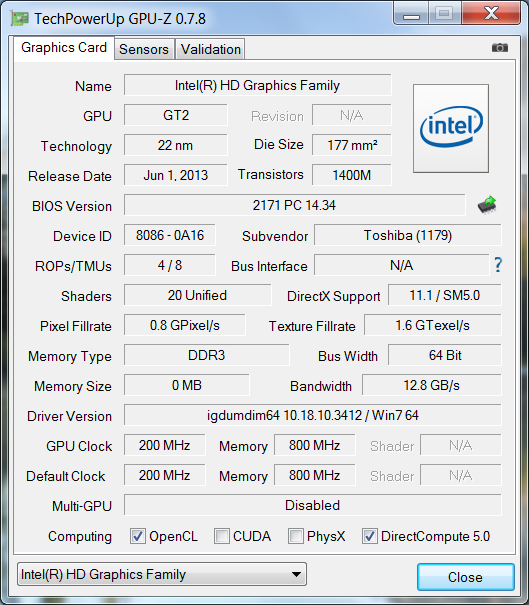 That is, Intel HD Graphics 4400, which is the standard integrated graphics for ULV Haswell CPUs. This particular variant features a clock speed which ranges from 200 MHz to 1100 MHz, depending on both demand and other factors (such as thermal headroom). The scores we received from our synthetic GPU testing are right around what we’d expect. 3DMark 06, for instance, produced a 4548 total score, which is 10% above the Fujitsu Lifebook U904 and HP EliteBook 850 G1-H5G34ET. 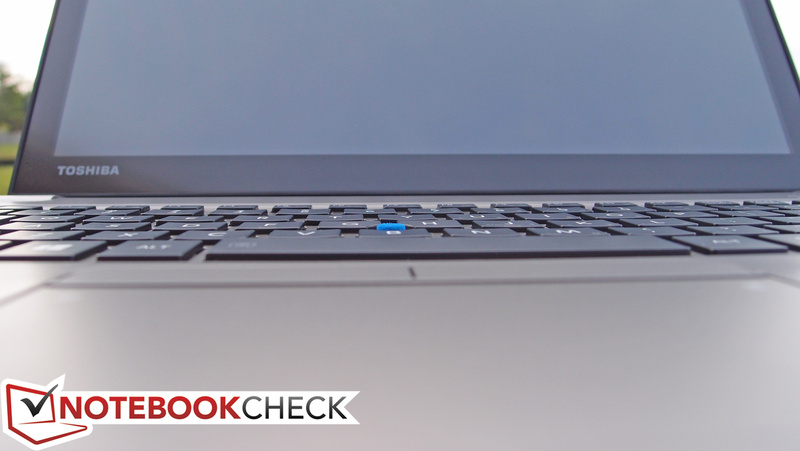 However, it’s also nearly 40% below that of models such as the Microsoft Surface Pro 2 and the HP EliteBook 840 G1. The primary reason for the discrepancy is that those higher-scoring machines all include dual-channel memory; with just a single stick of 8 GB of DDR3 RAM, the shared memory bandwidth available to the Intel HD Graphics 4400 in the Z40T is considerably constrained in comparison. The Z40T is a quiet machine under nearly all circumstances. 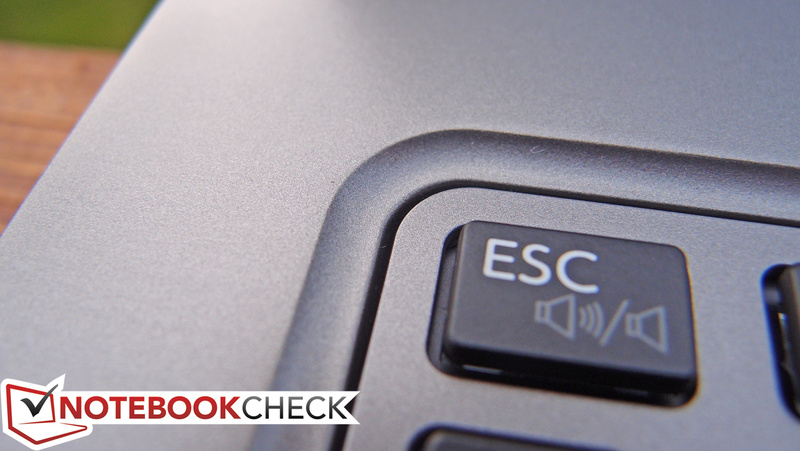 While idle, it’s ever-so-slightly louder than the quietest actively-cooled machines (such as, again, the Dell Latitude E7440, which idles using passive cooling), at 34 dB(A) average. Under heavy stress, things start to become louder, but not disturbingly so: at around 38.8 dB(A) median, the machine is suddenly more noticeable, but still within reasonable ranges. Needless to say, this produces some concerns about the thermal implications of such lax cooling mechanisms. In spite of our (rational) concerns about case temperatures given the reasonably low noise levels of the Z40T, they remain surprisingly unproblematic. 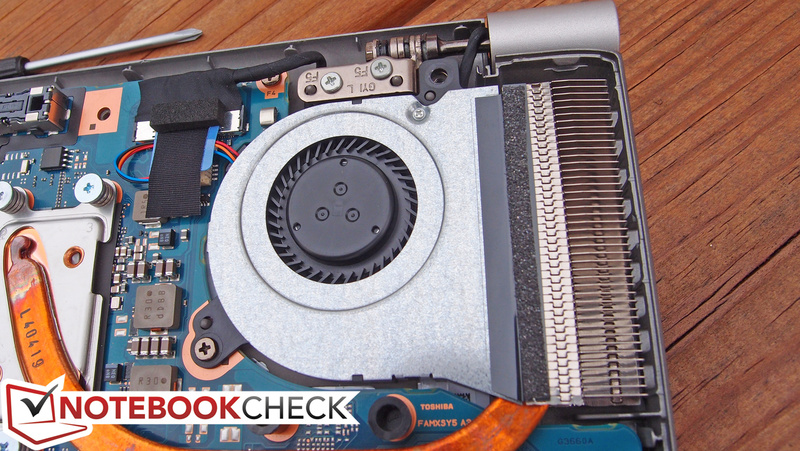 Both top and bottom of the base unit saw average temperatures of only 35.5 °C under load, with a single hot spot above the 40 °C mark in the center of the top of the keyboard (41.4 °C). However, idle temperatures remained slightly warmer than the norm at 33.2/33.5°C in those same regions. The most notable achievement in the area of thermal management is the fact that the palm rest and bottom of the base unit only exhibit very slight perceptible increases in temperature as typical loads increase during use. 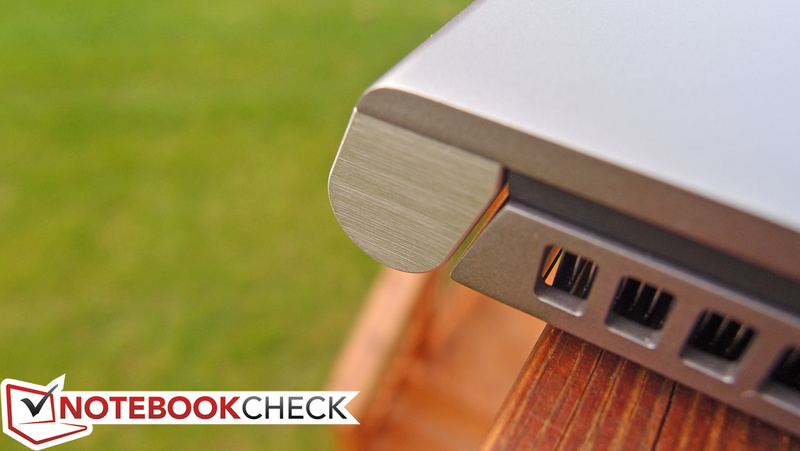 This makes the notebook comfortable for use on the lap in nearly all scenarios. (±) The maximum temperature on the upper side is 41.4 °C / 107 F, compared to the average of 33.9 °C / 93 F, ranging from 21.2 to 62.5 °C for the class Office. (±) In idle usage, the average temperature for the upper side is 33.2 °C / 92 F, compared to the device average of 29.4 °C / 85 F.
So, low noise, and low temperatures—what does this leave? 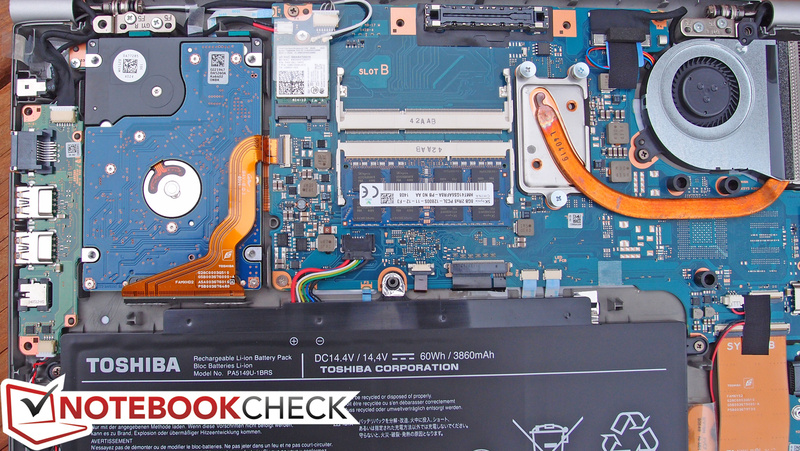 A strong suspicion for thermal throttling, of course; since chipset efficiencies haven’t changed between the previous hundreds of reviews we’ve done of comparably-equipped models and today’s Z40T test candidate, it’s only a reasonable expectation. 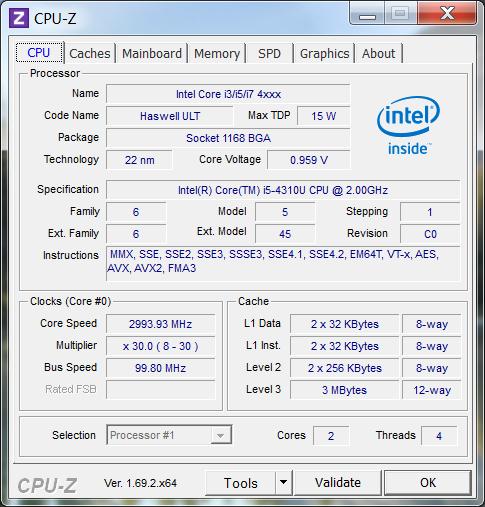 During full CPU stress, the machine quickly bottoms out at a stable 2.6 GHz for both CPU cores, with maximum internal CPU temperature readings of 70 °C—impressive (after all, the maximum Turbo Boost frequency for multicore operation of the i5-4310U is just 2.7 GHz, only 100 MHz higher). Full GPU stress changes matters, however, with a maximum GPU core frequency of 850 MHz (theoretical max: 1100 MHz)—though temperatures remain underneath the same 70 °C ceiling. While both CPU and GPU stress is applied, the GPU still manages the same frequency of 850 MHz, but the CPU sacrifices performance in exchange with a clock rate of 1200 MHz. 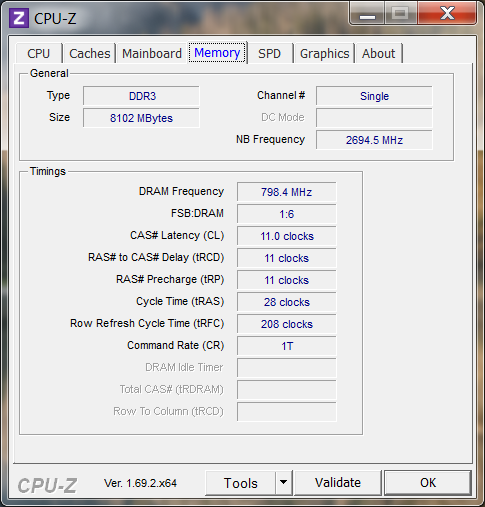 That’s below that base frequency of the CPU of 2 GHz, and it qualifies as throttling by definition. Tellingly, temperatures still refuse to exceed the 70 °C mark. It seems certain that the Z40T’s strategy is to suppress clock rates of the CPU and GPU to hold temperatures below this value. It’s an aggressive approach to firmware-based performance limiting to help reduce fan speeds and temperatures alike at the expense of some performance, under the (probably correct) assumption that most business professionals likely won’t miss it anyhow. The Z40T’s two front/bottom-mounted, down-firing speakers are loud enough when cranked to the max, but their sound profile is heavily concentrated in the higher frequencies. Hardly any bass is present at all, and even the midrange feels crushed in favor of ensuring that the trebles are clear enough to deliver intelligible voice reproduction. Regardless of post-processing options, any amount of music or film will quickly produce the need for external speakers or headphones. The Tecra Z40T’s battery life isn’t quite as impressive as it was on the Tecra Z40 A-147, most likely due to the fact that the higher-resolution screen consumes more power. 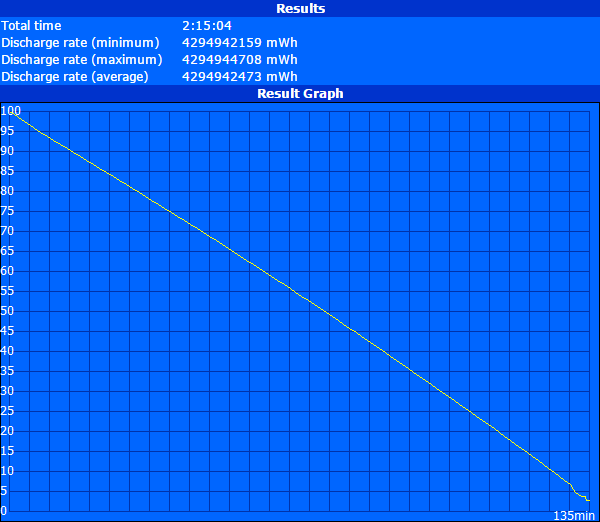 The battery is slightly smaller—just 2 Wh smaller at 60 Wh total—but that’s only a little over 3% less. For starters, idle and load values haven’t changed much; we saw 10 hours and 5 minutes of runtime in our Reader’s Test, which simulates bare minimum usage with all wireless radios off, Power Saver profile active, and brightness at the lowest setting. The Classic Test (maximum load, brightness highest, wireless on, High Performance profile) provoked a shutdown after 2 hours and 15 minutes. 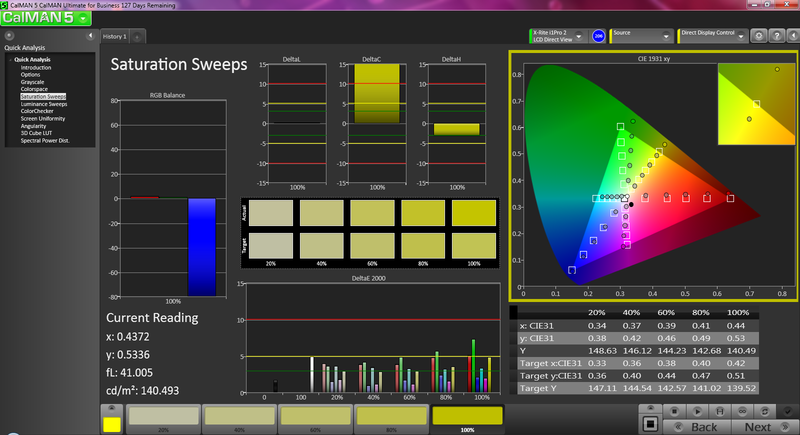 But the final test is the most relevant, as it simulates typical use of the computer by cycling through various websites at medium brightness (close to 150 cd/m², setting 5/8 on the Z40T). While Surfing with Wi-Fi, we measured 5 hours and 53 minutes of battery life. That’s not a bad result—it beats the Latitude E7440’s 5:31, for instance—but it’s over an hour less than the Z40-A-147 supplied under those same conditions. 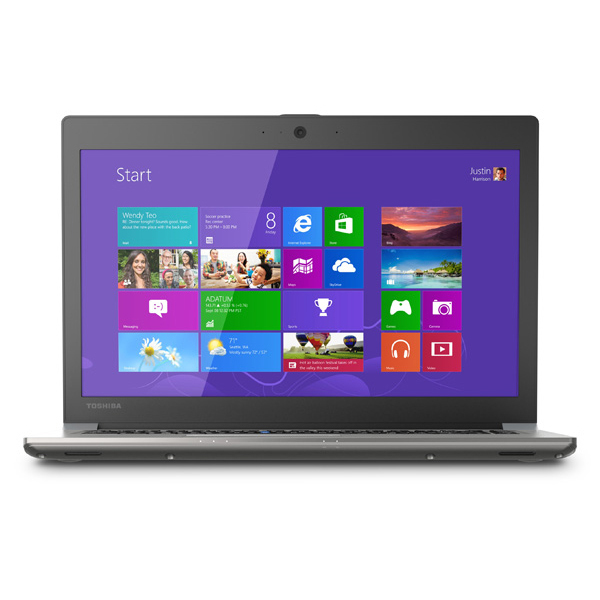 The Toshiba Tecra Z40T-A1410 repeats many of the successes of its lower-grade counterpart, the Tecra Z40-A-147, with lightweight magnesium construction, a solid assortment of ports, reasonably good battery life, low heat, and quiet operation. It also is one of the only machines currently available which offers a touch panel without a glossy finish—something which we normally greatly appreciate, especially on a business PC. But this is a highly competitive market, and the Tecra Z40T leaves too many issues on the table to receive a glowing recommendation. 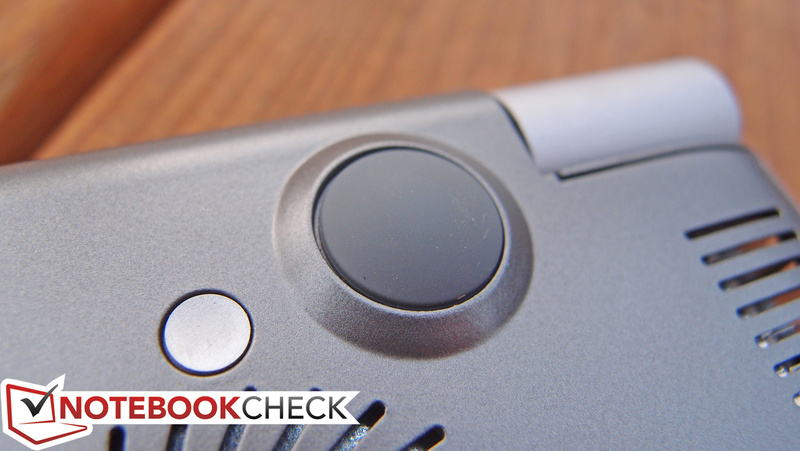 For starters, the matte touchscreen is only such thanks to an anti-glare filter on top of the panel surface—and its presence produces one of the grainiest pictures we’ve witnessed in a while. 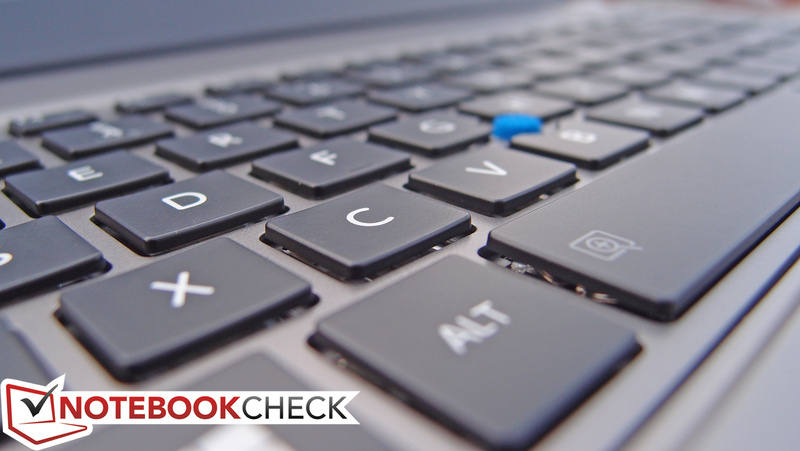 The input devices—a critical component of any business notebook—are average at best, with the keyboard too spongy and the clickpad perpetuating the negative reputation that so many of the buttonless models have earned. Furthermore, the machine’s performance suffers due primarily to the lack of a solid-state drive (and less so to the throttling we experienced under heavy synthetic load). Finally, maintenance is a tragic chore that seems as much an afterthought as it does an intentional exercise in frustration; no fewer than eleven screws and multiple rubber feet must be removed to allow the bottom panel to snap off of the unit, and even then care must be taken not to damage it. 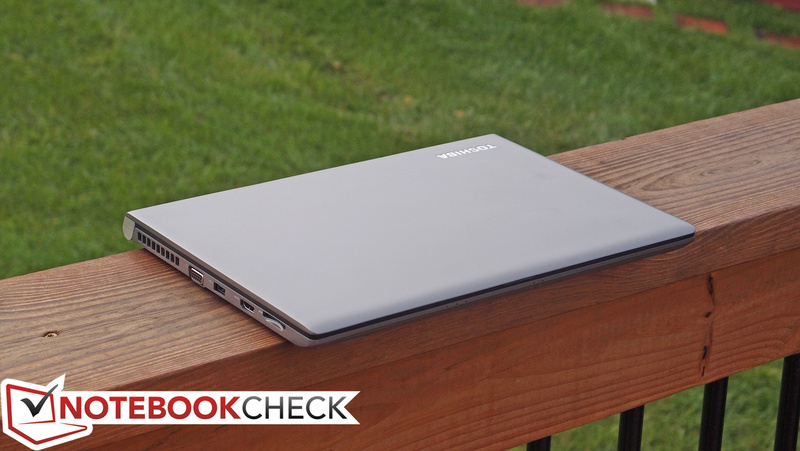 It’s not a bad machine, but for the price, better models already exist: have a look at the Lenovo ThinkPad Yoga or the Dell Latitude E7440 for two such examples. The keyboard can't quite match the ThinkPad and Latitude versions. 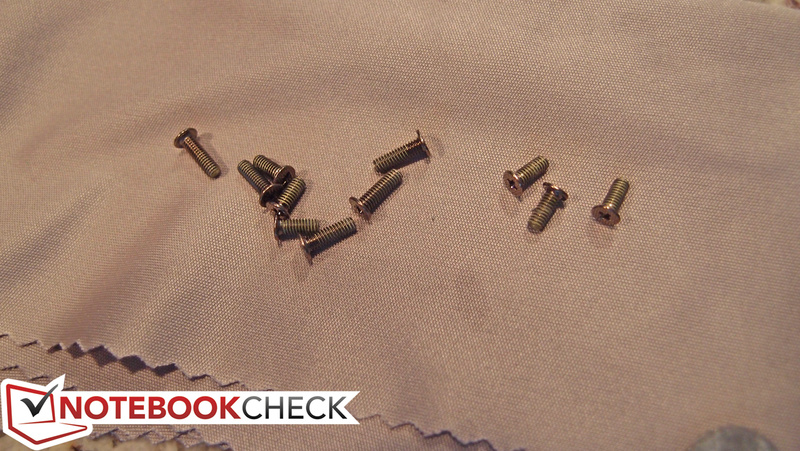 Screws are even located below the rubber feet. If you manage to open it, most components are replaceable. A second stick of identical memory would boost graphical performance considerably.